A GROUP OF 46,000+ VETERANS, LOCALS, AND MEMBERS EXPANDING A SUCCESSFUL COLONIAL INN, SHOPS, SPA, CAMPGROUND, WINERY, WINE BAR and CULINARY INSTITUTE with RESTAURANTS to A LARGER EXPERIENCE. WE BUILD NEW VET-OWNED COMPANIES AND TEACH VETS HOW TO BECOME COMPLETELY ENRICHED AND SELF-SUSTAINING. The ARWLHC is a United States Military; disabled veterans project designed to positively and economically benefit the American Southeast region via historical tourism, agritourism, private-public investment, veteran-owned businesses, Federal EDA infusion, and SBA 7A/504 loans. In just a few years, we have incubated 25 small companies, and obtained SBA loans with disabled veterans ideas, to fruition. We focus heavily on NAVOBA and VETREPRENEURS. We build companies for vets and put them into business for themselves instead of sleeping in the woods, panhandling, 22 vet suicides per day in America, over-medicating or looking for a check - to make a vet go away. Our project and mansion are currently following the Deerfield Inn as an example of starting a private museum, inn, and restaurant and growing it to a $31M endowment with $71M in assets. Our approach towards expansion is more rustic, log-cabin-like, in nature, and often called, "she-bang," "Mountain-man," or hillbilly. The mansion built in 1879 that we occupy is a family home created by Doctor Alfred Frederick Hambright - who also built a private museum and battleground celebration center. He was a veteran and the great-great-grandson of the famous Colonel Frederick Hambright that fought at King's (the previous grammatical spelling before 1900) Mountain. This provides evidence of endowment, incubation, and possibility as that private area became the Kings Mountain National Park. The Southeast region is home to the Mecklenburg Declaration of Independence and the first independent government in America ever formed without British rule known as the Watauga Settlement. We are included in one of the nation's 12 "regional powerhouses driving the U.S. economy," according to reports released by The Atlantic Cities. A dozen regions identified by them include "Bos-Wash," the largest region (#1) that includes Boston, New York, Philly and Washington, D.C. and "Char-lanta," which includes the Queen City (Charlotte) down to Atlanta. "Char-lanta" is described as being home to 22 million+ people and taking in 45 metro areas, including Atlanta, Charlotte, Raleigh and Birmingham, Ala. "With more than a trillion (dollars) in economic output, its economy is bigger than South Korea’s, placing it among the world’s fifteen largest economies," Atlantic Cities co-founder Richard Florida writes in the report. Knoxville, TN is one of only two cities in the South of the USA to make the top 100 wealthiest towns in America for household income. The other is Charleston, SC. The other 98 are West and North of us. For these reasons, we have established a ten-year travel continuum through this region to include driving trips also stopping at Jonesborough, TN, Unicoi, TN, Dollywood and Gatlinburg, TN, Johnson City, TN, Elizabethton, TN, Knoxville, TN, Asheville, NC, Charlotte, NC, Mill Springs, NC, Grover, NC, Kings Mountain and Cowpens National Military Parks, Charlotte, NC, Boone, NC, Blowing Rock, NC, Gaffney, SC, Spartanburg, SC, and Greenville, SC. In some cases, our long-range guests from across the earth have gone to beach areas of Charleston, SC, Myrtle Beach, SC, Wilmington, NC, and Hilton Head, SC. ~ Greenways ~ Solar, Thermal Powered ~ Natural Beauty ~ International destinations sharing the creation of America. A US Military DISABLED & INJURED VETERANS project. As featured in the news on CNN International, FOX TV, PBS Television, the Washington Post, New Yorker Magazine, Times of India, The London Times, Huffington, Post, Yahoo Shine, USA Today and over 150+ newspapers and magazines worldwide. Since 2008, the ARWLHC has received continued, private, infusion from Martin and Stormy Mongiello (their family and professional history) (German, Italian, English, French, American-Indian (Asian) and Scotch-Irish) and built the inn with a Press Office featuring television shows about their work (includes their biography, inn brochure, business research, and more). They have reviewed and endorsed the 30 painting series being conducted by the ARWLHC to showcase leaders and noted heroes - that have never been seen before. The primary focus is to rebuild such leaders and noted heroes so the modern world could know how they look and appreciate them. In 2011 interviews of ancestors, reviews of photographs of hundreds of tin plates, rebuilds of many heroes occurred. To date, the first ever public paintings in the history of the world have been completed of Colonel Frederick Hambright (Hambrecht - Hamprecht), Colonel Benjamin Cleaveland (Benjamin Cleveland), Catawba Nation hero Captain Redhead, Colonel Andrew Hampton and free black hero -Ishmael Titus. Noted artist, Jeff Trexler's, work on the fifth painting in 2015/2016 is unique as his overall work in the revolutionary war is heralded. The Catawba Nation hero, Captain Redhead, newly painted is due to influential help from the Catawba Nation, who helped to create the new country of the United Colonies. Moving into 2018/2019, we've announced and continued our next painting to be of Mary Patton, the local hero (now a TN heroine) who donated 500 pounds of black powder to the militia. In 2019, it has been stated to begin Susan Twitty of Graham's Fort, Grover, NC to be the next painting. Be sure to see our latest film worked on by the ARWLHC and many members in Alone Yet Not Alone. The film is complete with several weapons worn by our Master ARWLHC Armorer, William Richard King at King's Forge and Muzzleloading. Take special note of the many American Indians (actually Asians) showcased with Matt Dyer of Kings Mountain, NC and his shaved head. Thank you for your vote for selecting me as the Executive Director of the ARWLHC. I humbly accept the position of Executive Director. Your confidence and support, while evidenced in a leader or leadership group, is not just placed with them but continues to endorse the idea that the general public will benefit from the mission and purpose of the ARWLHC. I hope to be able to shepherd the organization as it continues to progress. As you all know, the ARWLHC is poised to fill an essential gap in Upstate South Carolina and Western North Carolina. This area, so vital to the success of the American Revolution, does not provide members of the general public - and our children in particular - with a dedicated place to go and interact with re-enactors and artisans telling the story of the common people who did the majority of the living and dying during the time of the Revolution. Most of the local battlefields and parks benefit from professional staff and fancy programs that are publically funded. I am not saying that is all bad or should be changed. 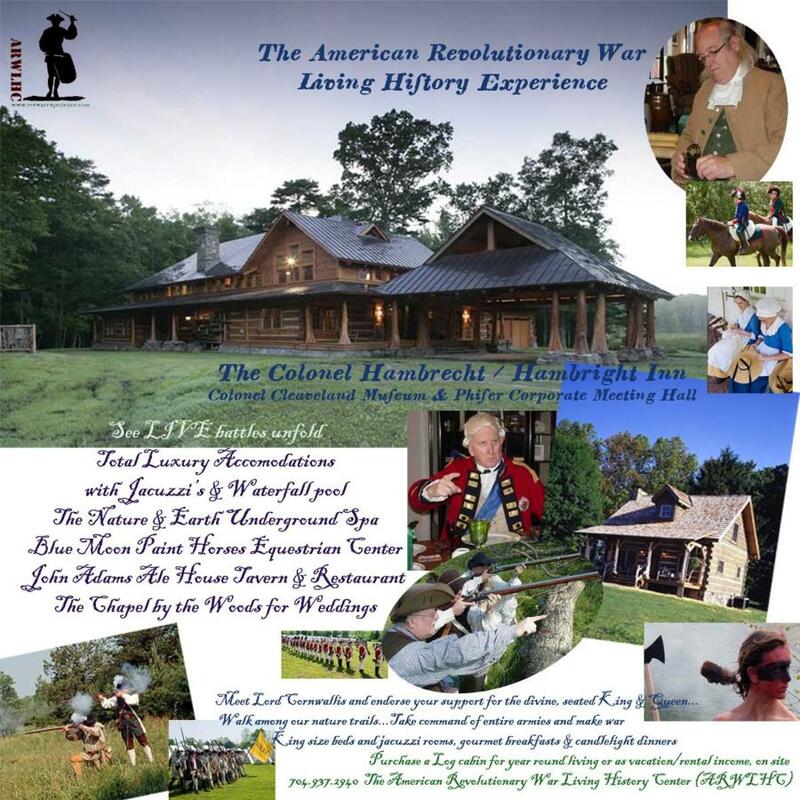 What I foresee is the ARWLHC allowing those same members of the public who visit these heritage sites the opportunity to experience and learn the American Revolution through the proposed plans for the ARWLHC. Thus, the ARWLHC can be a vital complement and companion to the established battlefields and parks. This can be done by continuing to grow public awareness and interest in the mission of the ARWLHC. This can be done by all of us continuing to support each other. This can be done by keeping the faith in liberty and the promise of a better future that sustained our forebearers. Thank you again for your support of the ARWLHC and its leadership. Previous Executive Directors are Martin CJ Mongiello (acting 2008 and now Emeritus), David Sherrill (elected 2009-2010 awarded the ARWLHC Pin for Distinguished Service) and William Richard King (elected 2011-2012 granted the ARWLHC Pin for Distinguished Service) Master Armorer of the ARWLHC and owner of Kings Forge and Muzzleloading. After Mr. Anthony's 2013-2014 term, due to his success with the National SAR Convention held in Greenville, SC, his term was extended by the corporate board of directors of the ARWLHC for an additional four-year term, to 2018. For 2019 to 2022, Mr. Anthony was affirmed by the Advisory Board and Board of Trustees as a Senior Trustee. Furthermore, Martin CJ Mongiello, of Mongiello Holdings, LLC DBA the ARWLHC stated, "Mark was awarded the Presidential Service Center Distinguished Service Medal (DSM) along with Joe Epley in the year of 2015 at a commemorative dinner. Mark also ascended to the National structure and SAR level of command in Lexington, Kentucky, headquarters of the SAR. Mark is doing an excellent job in industry and museums and has our family's direct trust and care."